and I want to impress upon others the importance of farm-grown foods. My passion for healthy foods has given me the drive and ambition to seek a nutritional science major in college and career of making people healthier through proper food and nutrition. , walnuts are often overlooked and dismissed as ‘boring’. However, beneath the firm shell lies a nutrient packed snacked that has health researchers and dieticians going nuts! Two decades of extensive research on the health benefits of walnuts have revealed that not only do these crunchy, delectable nuts contain significantly high amounts of omega-3’s alpha-linolenic acid and polyunsaturated fatty acid (a good thing), walnuts may also aid in weight maintenance, heart health, cognitive functions, and fighting cancer (a great thing)! In a study published in Nutrition and Cancer in September 2008, it was revealed that mice with human breast cancer tumors that were fed one serving (one ounce) of walnuts every day had their tumors significantly reduced after thirty-five days in comparison to mice that were fed corn oil and various other vitamins and minerals (walnuts.org). Just one egg-sized serving of walnuts provides four grams of muscle-building protein, two and a half grams of alpha-linolenic acid, and two grams of fiber. Although calorie-dense (190 calories for one ounce), the benefits of walnuts are difficult to ignore; who wouldn’t want to help their body to fight cancer and improve their cognitive processes? aintenance of farm equipment, safe usage and storage of pesticides, caring for hundreds (or thousands) of trees, and scheduling for irrigation and harvesting. Farmers are increasing under the pressure of complying with federal and state regulations all in order to provide consumers with a safe product. Becoming a successful walnut grower takes an incredible amount of dedication, patience, and perseverance; walnut seedlings take five to seven years before they are able to be harvested from the tree, and trees are susceptible to harsh weather conditions, detrimental pests, and disease. The harvesting process begins at the end of August and continues through November. Once the floor of the orchard is properly prepared (mowing, leveling, watering), mechanical shakers vigorously shake each tree, causing thousands of walnuts to fall to the orchard floor and allowing them to be swept by a mechanical sweeper. The walnuts are then picked up by a mechanical picker. Mechanization is a crucial part of an efficient harvesting operation. After the walnuts are harvested, the walnuts are taken to a walnut huller, where they are cleaned and dried. Walnuts are then shipped to a processor where they are hulled and graded into two categories, shelled and inshell. I’ve learned from a tour of the Crisp Walnut plant that shelled walnuts are cracked then separated from their shell as to not include any shells or foreign material in the packages. The meat of the walnut is laser sorted multiple times, hand sorted on slow moving belts, and physically inspected to meet health and safety standards. Safety and cleanliness are extremely important to the Crisp plant and inspections are performed regularly to insure the consumer has safe food. 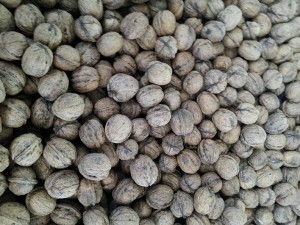 The inshell whole walnuts are sized to meet the USDA specifications, and then bagged. Both inshell and shelled walnuts are shipped to stores to reach consumers around the world. Walnuts are sold year-round, providing texture and flavor to any dish no matter what the season. While consuming an ounce of plain walnuts every day can become lackluster and unexciting, walnuts are versatile and can add a crunchy texture to almost anything, enhancing salads, breads and cookies. Try the following walnut recipe to add flavor and excitement to your diet.